Refurbishment work at Poulton-le-Fylde on 9th December 2017. 281 viewsAlthough the station is closed until March 2018 the tracks have to be kept clear as engineering trains continue to pass through going to and from Blackpool North. The semaphore signals and box were still in place on this day but can’t last much longer. 68031 brings up the rear of the Pathfinder Tours TRANS PENINE DELTIC LAMENT through Leyland. 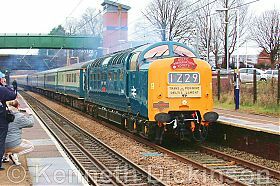 232 viewsThe tour from York to Liverpool hauled by D9009 ALYCIDON . D9009 Alycidon leads the Pathfinder Tours TRANS PENINE DELTIC LAMENT through Leyland. 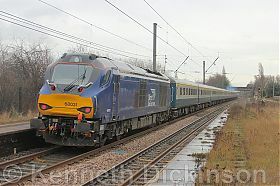 237 viewsThe tour from York to Liverpool was tailed by 68031.